I am looking for a nice "repainter" who could help me. for painting the tail of my DC8. I am trying to paint the DC8 in the colors of the French airline, Transports Aériens Intercontinentaux (TAI) today disappeared. For the tail I give up. Can not have TAI on both sides, I have a misalignment. see picture. and below a photo of the tail of the real plane. and what I would like to have. You need to break the graphic in two pieces. Duplicate the text so you have each in a separate layer. What I do is make the layer that will be on the rudder invisible and then position the one on the fin as desired. Then I erase that layer aft of the line made by the edge of the fin. Then I make the layer on the rudder visible, get it to line up, and erase the forward part of it. If you are truly stuck you can send my your photoshop file and I will do it for you. If you don't have some program other than FSX to see the result so you don't have to reload the aircraft for each change, I agree it's not easy. Thank you for the answer. Break the graphic in two pieces ?? You mean, separate the vertical stabilizer (vertical tail) and the rudder, I do not understand very well. I do not easily manipulate layers, but I will try, and if I can not do it, I will contact you. I do not have photoshop but only Paint.net and Paintshop pro that does not work well because it is for XP 32 bit version, and I am on Windows 7 64. As Michael says, you basically have to bridge the gap between the rudder and the vertical stabilizer. 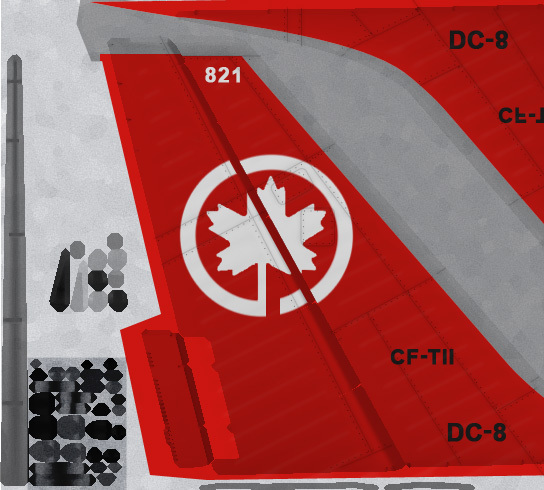 After several hours, and with your explanations, I ended up finishing the tail of my "DC8 TAI". Nice work! I'm happy to see that you figured it out.